After the success of Disney's 2012 computer animated Wreck-it-Ralph, it was pretty clear that we would end up getting a sequel and now, 6 years later, we finally have a trailer for the long awaited Ralph Breaks the Internet: Wreck-It Ralph 2. Disney Animation announced the mouthful of a title in the summer of 2017, but it's been relatively quiet on news front for the sequel lately. However, we were just treated to the motion poster that arrived earlier this week, which showed us who exactly broke the internet. Spoiler Alert: it was Ralph. Now we have the full trailer and an official synopsis. "Ralph Breaks the Internet: Wreck-It Ralph 2 leaves Litwak's video arcade behind, venturing into the uncharted, expansive and thrilling world of the internet, which may or may not survive Ralph's wrecking. Video game bad guy Ralph (voice of John C. Reilly) and fellow misfit Vanellope von Schweetz (voice of Sarah Silverman) must risk it all by traveling to the world wide web in search of a replacement part to save Vanellope's video game, Sugar Rush. In way over their heads, Ralph and Vanellope rely on the citizens of the internet, the netizens, to help navigate their way, including a webite entrepreneur named Yesss (voice of Taraji P. Henson), who is the head algorithm and the heart and soul of trend-making site "BuzzzTube." Directed by Rich Moore and Phil Johnston, and produced by Clark Spencer, Ralph Breaks the Internet: Wreck-Ralph 2 hits theaters on Nov. 21, 2018." Long title aside, Disney finally revealed hat the trailer was coming yesterday and it looks just as visually stunning as the first Wreck-it-Ralph, with the return of John C. Reilly as Ralph, Sara Silverman as Vanellope von Schweetz, Jane Lynch as Sergeant Tamora Jean Calhoun, Jack McBrayer as Fix-it-Felix Jr., and Alan Tudyk as King Candy. In addition, a new character named Yesss voiced by Taraji P. Henson will meet up with Ralph and Vanellope. Ralph Breaks the Internet: Wreck-it-Ralph 2 takes place 6 years following the events of the first movie when a Wi-Fi router is plugged into the arcade. The sequel will focus on Ralph's adventure in the internet data space, wrecking the web as only Ralph can do. The brief footage shown at the D23 expo over the summer featured the owner of the arcade plugging in the internet and then switches to Ralph and Vanellope exploring a port where Vanellope gets sucked in. Co-Director Rich Moore, who recently won an Oscar for Zootopia, talked about Wreck-it-Ralph's adventures in the internet, where he said, "To take these characters we love and have them enter the enormous world of the internet has given us so much to explore." Moore went on to say that the production team has been hard at work to try and deliver a fresh and imaginative look at the internet, a place that everybody is familiar with. The internet is kind of a giant place, so it will be very interesting to see where Ralph and friends travel to when Ralph Breaks the Internet: Wreck-it-Ralph 2 is released in 2018. Ideas of a sequel had been floated as early as 2012, but writing did not take place until 2014. John C. Reilly signed on to reprise his role as Wreck-it-Ralph in July of 2015, while the movie was still being planned. At the time Reilly said that, "Ralph is a character very near and dear to my heart. I'm really looking forward to playing the big lug again." The actor added that making the first Wreck-it-Ralph was "one of the most special experiences I've ever had." Ralph Breaks the Internet: Wreck-it-Ralph 2 will finally wreck theaters on November 21st, 2018 which is a bit of delay from the original March 9th release date that features some pretty stiff competition with Ava DuVernay's A Wrinkle in Time. While we still have quite a while to go before we see Ralph Breaks the Internet: Wreck-it-Ralph 2 in theaters, the trailer has just added a lot more excitement to a movie that already has a ton of excitement surrounding it. 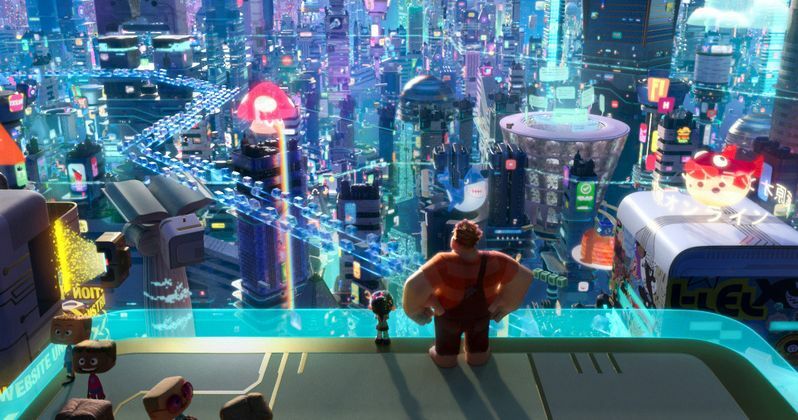 Make sure to check out the visually stunning trailer for Ralph Breaks the Internet: Wreck-it-Ralph 2 below, courtesy of Disney.